Canting Batik Craft is originated from their interest in art and home decoration. Inspired by their visit to a friend who made batik wallhangings in large size, they decided to take part in the business development and gradually expanded their own business lines. From years of experience and learning international taste, they now have a gallery showcasing many types of mini jacket in different sizes to cater variety of clients’ needs in decorating works. Canting jackets have decorated many houses, apartments, hotels and mansions all over the world. They both have the same dream to let the world enjoy their batik’s masterpieces in a whole new perspective. 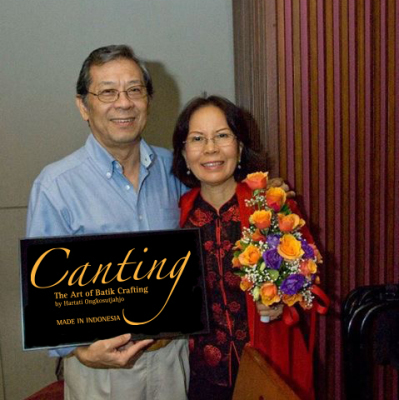 Along the way, Canting Batik Craft has been participating in many social events at least twice a year, such as Nederland Embassy's Bazaar, Singapore Embassy's Bazaar, Local and International Bazaars: WIC, AWA, BWA, AUSI, ANZA, Canadian, Indian, JIS, British School, French School, AIS, Singapore Women International Club, and Bazaar in Kuala Lumpur Malaysia. Our top selling jackets out of 50 types are Ragil, Bidadari Cilik, Loro Blonyo and Pangeran. We produce an estimated 200 pieces of the small size jackets per month. To create one piece of artwork takes about 3 to 6 weeks starting from the design concept to choosing the materials, sewing, quilting, beading, and finally to the finished masterpiece. In conclusion, what we do is creating a fully handmade masterpiece decorative beeded jacket artwork with esquisite details with lots of love and passion. Every single one of them is a masterpiece because every single one is surely different. We use only selected high quality batiks and materials for the best result. The exclusive packaging also adds the value of the product itself. Very recommended for home decoration and personal gift idea. The daily live of Javanese communities including Royal Families and peasantry are still greatly influenced by ancient mithology and legend. Therefore their spirit and way of life are embeded on a piece of cloth defined as BATIK. It is more than just a piece of textile sheet with particular design, style and colour. It contains deep philosophy throughout symbols drawn on it. Batik are worn as daily dress as well as for ceremonial occations and ritual activities countrywide.